Lesley is a Program Manager for University Sustainability Practices at Arizona State University. 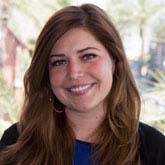 In this role, she manages a variety of sustainability projects at ASU’s Tempe campus, including policy development, staff engagement and professional development. She works with internal partners to advance sustainability practices within their day-to-day operations. Lesley holds a Master of Arts in Environmental Studies and a Bachelor of Arts with a double major in Environmental Studies and Psychology from the University of Southern California. Prior to joining ASU, Lesley worked on air quality policy for the Arizona Department of Environmental Quality. She has held several roles in community outreach and environmental conservation at non-profit organizations and government agencies in the Phoenix area, including her current role as Commissioner on the City of Phoenix Environmental Quality & Sustainability Commission.